I think Spring is on it's way! Not sure about you, but here in Upstate NY, it's been chili! It's my understanding that Spring is a time for the weather to tease us about the coming of summer! Well, I'm patiently waiting! Brrrrrr! In the meantime, I completed the April Penny Rug of the Month. I'm enjoying working on these penny rugs! They are so cute! Hoping your Spring is warmer then here in Upstate NY! Cheers! Just wait -- colder weather is coming LOL. It's drizzly and gray here today. 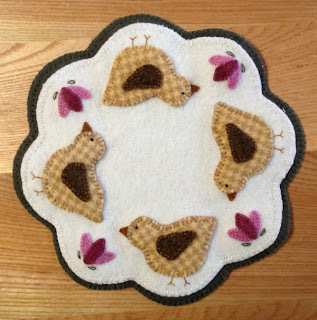 Those little chicks are adorable -- they look like a fun project! That is such a cute piece, perfect for Easter. We are getting warmer temps, so nice to sit out on the porch again. The little chicks are so sweet. It is warm here and the air-conditioning running. Sorry you are still being teased with warm weather and a toss in of cold. Don't you just love wool applique!! !